I love this font but when I use it (I use a macbook), how the letters look like is incomplete. @knuamorin What do you mean exactly? @MistiFonts I'm having the same trouble as @knuamorin. I wish I could upload a screen shot. It looks like the top and bottom of the font is cut off. @MistiFonts If you can share your email address I can send you a screen shot. @knuamorin and @imnslp, have you tried changing your line spacing? ikr! cant help saying this but... SO COOL! @CrystalWings I'm glad you like it! Hi, I love your fonts!! I am having though the same problem some of your users, I have a Mac, once I am in Word, letter appear incomplete from bottom and top, is there something I am doing wrong? How to donate and use for commercial use? Whats a good font to pair this with? @ljramirez25 I think a clean, handwriting font would look good with this. For example, my fonts Spring is Coming or Springtime in April. Also, my font Better Together is a mono weight, bouncy script and provides a nice contrast to Watermelon Script. I hope this helps! I love this font, but mine also is cutting off the top and bottom on my mac. I've tried changing the spacing. Is there anything else I can do? 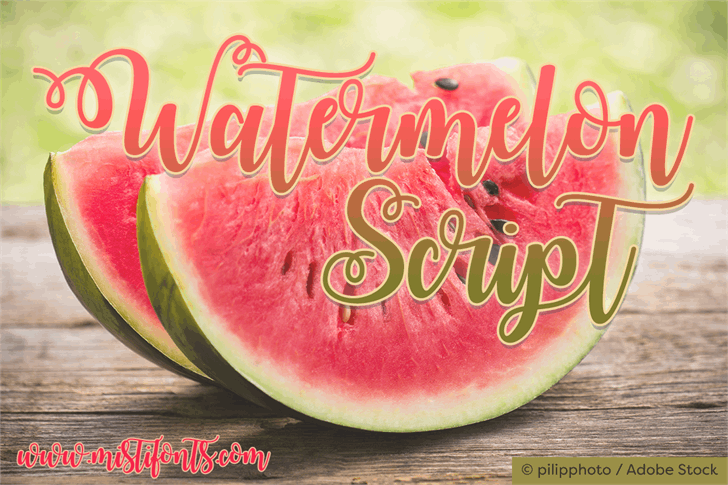 Watermelon Script Demo is a trademark of Misti's Fonts.